In the runup to the game's release last year, Mafia II's development studio and publicity team tried, with limited success, to set reasonable expectations of the game. "It isn't Grand Theft Auto," I was told, more than once, in emails and in the game's review notes. The talking point reflects the popular expectation, built over a decade of Grand Theft Auto releases and numerous imitators, that open-world games necessarily meant a sandbox. In popular expectation, they'd come to mean large maps littered with side quests and diversions, and key story missions that could be triggered out of order. This is especially true of crime thrillers, and absolutely true of major releases. But it wasn't true of Mafia II, by a longshot, and it was beat up pretty bad for not being something it never said it was. Mafia II was disappointing for other reasons, but I want to replay it now that I've spent a solid week playing and replaying L.A. Noire. Yes, both are crime thrillers set in postwar America, but that's not their chief similarity. They're open-world games that, in ways large and small, are both linear, sometimes rigidly. And if L.A. Noire splits, in the popular mind, the 10-year arranged marriage of open world to sandbox, then it should be acknowledged that Mafia II had the unhappy duty of taking a crack at it first. I have to wonder how we'd feel about Mafia II had it released this year, and L.A. Noire last year. Mafia II may still have been a disappointment; both are story-driven enterprises and Mafia II's, while set up well in the game's first half, nosedives into a tremendously unsatisfying resolution. L.A. Noire holds up throughout, though chiefly by connecting you to your character through the interrogation minigames and your own offline analysis of the evidence he collects. Yet the game still keeps him at a distance. Cole Phelps is available only when he's on the clock. You're not going to a bar with him; you're not going on a date with a secretary in records. You're not going to shoot pool with your partner or bet on a fight. Though, given how time consuming these diversions were in Red Dead Redemption and Grand Theft Auto IV, Team Bondi's choice to keep this focused on a compact narrative is certainly defensible. What it ultimately means, is like Mafia II you are given a beautiful, vast landscape that the game allows you to explore only on strictly controlled terms, especially within the main story. And I'm trying to figure out why I find that acceptable in Los Angeles but not in Empire City. Especially when L.A.'s environment in Noire is double the size of Empire City's. Mafia II may have built a world that fetishized trivial interactions-light switches, toilet flushes, buying gasoline-but there was, shockingly, more interaction on its map than there is in L.A. Noire's. In Mafia II, a clothing store, auto shop or payphone provided a means of losing police pursuit that was critical in some missions. A diner's food offered health recovery. In L.A. Noire, there's only the gamewell phone, which glows blue on your map, practically demanding that you use it to unlock the next location to investigate. L.A. Noire's broader story - the career of a cop - is more undermined by that kind of linear structure than Mafia II's is by its. 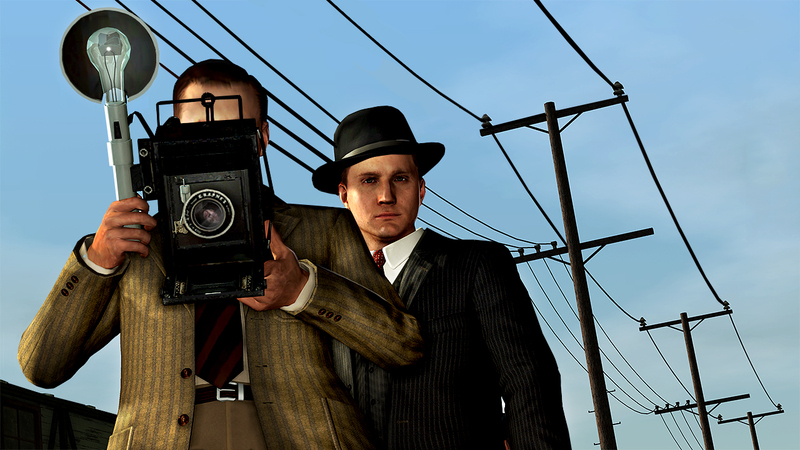 It takes until L.A. Noire's 12th chapter to find yourself investigating evidence in two different cases. Real-life detectives work multiple cases and the most sensational ones lead to an arrest after months. A sandbox format would allow multiple cases to be presented realistically, and not as discrete stories to be solved sequentially, but as a series of developments happening concurrently. In this regard, the lack of a sandbox environment is more of a missed opportunity in L.A. Noire than it is in Mafia II. That's not to say L.A. Noire is a better game only because of some double standard applied to Mafia II. L.A. Noire's characters are more believable, their emotions are more honest, their personalities more unique than Mafia II's, which started strong but descended into a color-by-numbers story of mob-movie stereotypes. L.A. Noire's investigation game is fascinating to me; Mafia II's action was often served up in derivative shoot-outs and courier missions. Its main continuity is shorter than L.A. Noire's. And Mafia II's downloadable content was abysmal, where prospects for L.A. Noire's are much stronger. Structurally, though, they're much the same. I have no more map-memory in L.A. Noire than I do in Mafia II. They aren't places to me as much as they are stages. But I can tell you how to get from Washington Beach to Prawn Island; or from Ganton to Vinewood. Vice City, San Andreas, to me those are open worlds, with an emphasis on the latter. There's a location in L.A. Noire that I found particularly ironic, the crumbling set of Intolerance, one of Hollywood's earliest box office flops. You visit it twice. L.A. Noire in 1947 is, like the set of Intolerance, very magnificent scenery, much of it unused. Mafia 2 was a great game, yet despite my constant suggestions to friends / who ever might listen, nobody i know has given it a shot. I only played it for a few hours at a friends house, but I adored it! I ordered it online a couple days ago for $24 for the directors cut. I hope you're both right. I suspect you are, much like The Sabotuer only received lukewarm reviews and I thought that was a great game. Like the article points out, its isn't 100% free roam, but the game goes through several decades as you play. Spending some time free roaming on your own accord can be visually rewarding in its own right. The part of the game where you get sent to prison will stick in my mind as an awesome piece of gaming cinematography. Mafia 2 was ok. Didn't hold a candle to the first one and had an ending that felt unfinished. I'm not saying it was, I understand the message they wanted to send with the ending but it just came across as hamfisted and unfinished. The game was good. Wasn't great. Awesome few set pieces but somewhat average overall. I loved Mafia II, while it wasn't a huge open world, I did like the fact that it had it as it made it feel like you were part of a huge world, even if it was a linear story. I know people that live in Melbourne for over 18 years, but still haven't been in every suburb. When watching the reviews for LA Noire, I found it strange that while Mafia II's review score was brought down because of the lack of the use of the open world, LA Noire still managed a 9 or more from most reviewers, but only gave a slight mention of it. I think the rockstar blinders were on a tad high for this game. 1. I don't particularly think 7s (from the reviews I read which made me buy the game) are bad scores. 2. The story, which was the focus of the game, was largely uninteresting. I feel that if they truly thought that story was paramount and they didn't want to detract from it then, well, they should have offered a story that was a little more subversive and less shallow than it was. The main character was poorly written, he was pretty much a blank slate with sub-par voice acting. You could say the same with L.A. Noire but Staton's performance does elevate the character a lot. What I feel games are lacking in terms of story is the ability to take their time with it. You'll notice that the final moments of a good film will give you time to process what's come before preceding the conclusion. Games don't generally do this. They will have the biggest shootout/fight/chase sequence in the game (which they see as the conclusion) followed by a 30 second cutscene. I'm not saying games need to be like movies but if they truly want to affect, they have to learn the art of storytelling, which is universal. To me, that's the true appeal of L.A. Noire, it gives the player time to immerse themselves in the story and the characters. It lets you feel the era, racial tensions, masochism and ignorance are all given ample time to unfold. Mafia 2 just runs along at a pretty quick pace, is rather shallow, doesn't relent and as a result, the end just comes and you're left unsatisfied. I know what they wanted with the story, but for a game that focus' on it, it should've been better. At least the story was still better than Heavy Rain. I love L.A. Noire largely on the atmospherics. The motion-capture is fabulous but the interrogations are often let down by the limited options available (it's crying out for a Bioware-style dialogue wheel so you have a sense of where Cole will take a question, not so important for "truth" but definitely for picking whether you should be opting for "doubt" or "lie"). The car chases are fun but the running, fighting and shooting mechanics are meh. The story choices are... interesting, but it's not the best ever. But it really does immerse me in the world of 1947 Los Angeles. I do find myself driving to the next destination manually, listening to the radio, checking out the stores and landmarks, listening to the banter of pedestrians. I don't care that I can't eat at some diner to restore health or play a pool minigame (although I would have welcomed the chance to interact a bit more with the game world in some way). It's a fabulously realistic-looking world, which immerses me in the game far more than any game world I've ever known except perhaps for Deus Ex. MAFIA II failed because too many missions had you driving from point A to point B, solely to watch the cut scenes inbetween. L.A. Noire may have cutscenes every time you enter a new location, but they are only character introductions or story set-ups that then proceed into the actual gameplay. 70% of Mafia II's gameplay WAS literally driving. Period. A terrible waste of such a rich looking game environment. oh, and in response to the writer's point that L.A. Noire's Los Angeles location is much un-used. Cole Phelps works at a number of stations throughout the game and because of this, is restricted to crimes within the boundary of said stations. You can't expect the developers to drop crime scenes over the entirety of the map, because obviously the more distant crimes would be outside Phelps' juristiction. And if you were to counter this by asking "why use so much of Los Angeles?" Well, haven't you ever heard of DLC (and no one does DLC as well as Rockstar)...? As someone who hasn’t played LA Noire yet, but looking forward to it, I’ll reiterate what I said in some previous posts. I don’t understand why LA Noire is an open world. It shouldn’t be, it was a waste of time and resources. If they removed this and made it direct travel from some sort of overhead map (I’m thinking Blade Runner here) then we wouldn’t be having this conversation and the game would still be a 9. Picked up Mafia II a couple of months ago for $20.00 brand new. Great game. Still got a few missions to go. I think for the strength of the narrative the linear restrictions have neccessary weight. Ultimately and open world with total freedom and consequences etc. is simply a far better experience at the risk of making everything in GTA's image. I'm enjoying Mafia II and after I'm done with Dirt 3 i'll take a look at L.A Noire.